Trigger and Donald. Image via LIFE, taken 1949. Now, before you accuse me of going all Horse and Hound on you (btw, that YouTube clip features Julia Roberts in a tie! Love! ), this picture explains how I got on the path to the images of the sporting ladies. I recently learned that Maryland had an official state dog called the Chesapeake Bay Retriever, and was one of only eleven states to designate an official state mutt. The “Chessie” is a breed that traces its roots back to two Newfoundland pups rescued from a ship called the Canton that foundered off of Maryland in 1807. 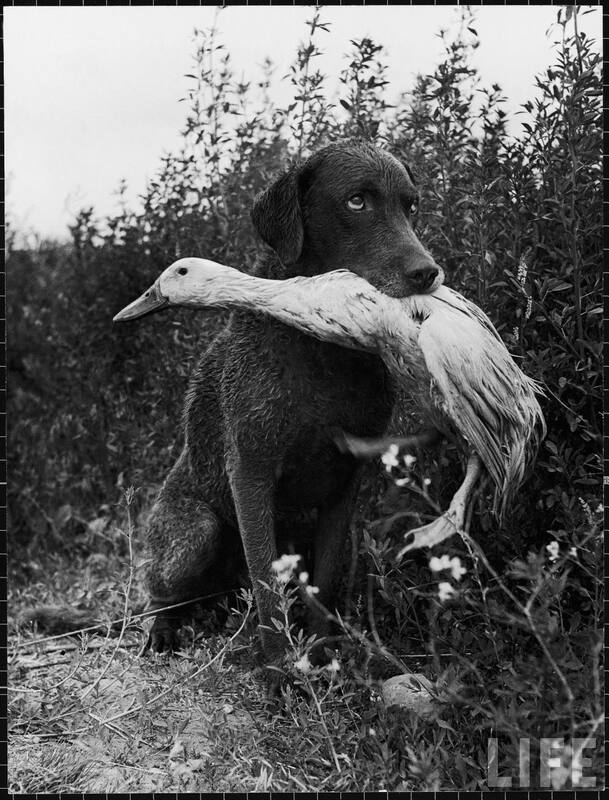 The dogs were then bred with local retrievers, eventually resulting in this curly-coated, water-loving, gundog that somewhat resembles a Labrador. George Custer was a fan of the breed, taking his Chessies with him on the battlefield. Teddy Roosevelt also had a Chessie, named Sailor Boy, who was supposedly a descendant of Custer’s dogs. So, why the duck picture? 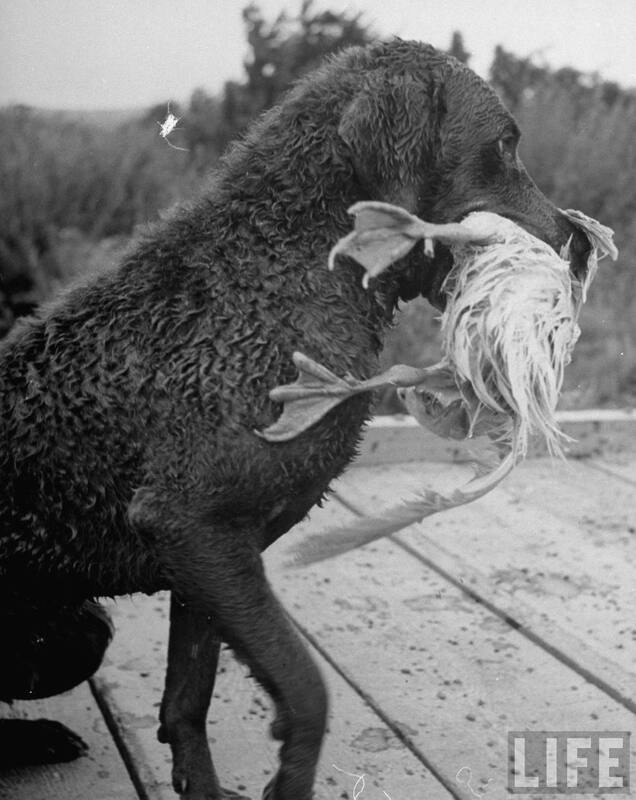 Well, in an effort to find a picture of this storied American breed, I came across these images of Trigger and his best friend Donald (yes, the duck) in the LIFE Archives. Evidently Donald hated the water and whenever his owners would throw him into the pond so that he could be with the rest of the ducks, Trigger the Chessie would immediately jump in the water and gently retrieve Donald. Too hilarious not to share. I enjoyed your “Chessie” pictures. Completely agree. Many thanks Joanne. You are currently reading LIFE Archives: Chesapeake Bay Retriever at Quite Continental.